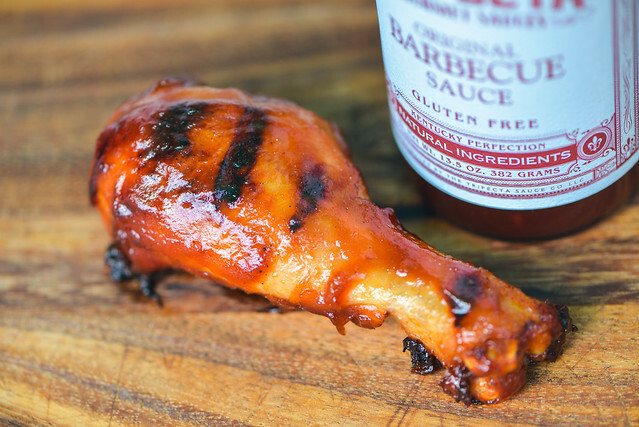 A bright and fresh flavor that brings in an excellent balance between sweet, tangy, and spicy makes Trifecta Original Barbecue Sauce a great all around choice suited for almost any barbecue or grilling need. Of all the sauces I review this year, Trifecta Sweet Heat stands out as a favorite among the crowded field. 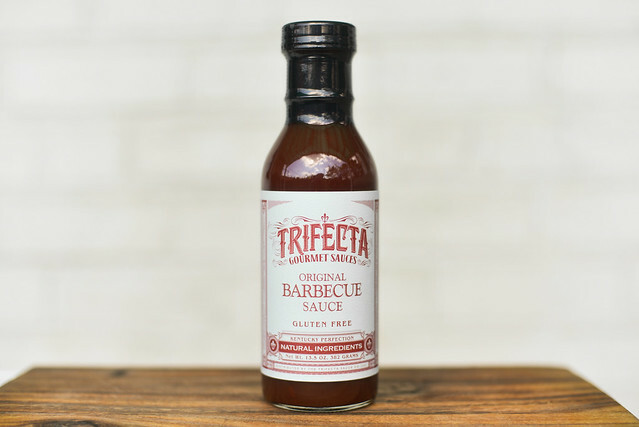 Wanting to close out 2014 with a high note, I turned to Trifecta's original sauce to hopefully deliver a similar all-around great barbecue sauce experience. This was the second sauce sent to me by Trifecta Gourmet Sauces, which unexpectedly planted its roots in 1996 when creator Matt Trimpe ran out of barbecue sauce at cookout and was left trying to concoct something akin to his mother's sauce out of memory. What he devised was so good that it spread through his circle of friends and family to the point where he realized the potential for it to be bottled en masse. A sweet and tangy aroma defines the first whiff of Trifecta Original. A mess of sugar mixes with the fruity tomato base to give it a ketchup-like character that has an extra vinegary depth. It's a bright, natural smell that's made even fresher by the addition of sweet onion and a light garlic undertone. There's little discernible heat, but there's some extra defining elements like Worcestershire and a bright lemon acidity that come out after a few good whiffs. Following the script set by Sweet Heat, the original recipe has a reddish-orange hue in a semi-transparent base that lands right in the middle of the thickness scale. It keeps the smooth saucy texture that's broken up by chunks of translucent onion. From a suspended spoon, the sauce first falls in a big chunk, then is quickly followed by a few smaller globs. A last drip slowly makes it way to the edge of the silverware, then falls, leaving a medium coating of sauce still clinging on. Trifecta Original gets going with a super sweet start. It's primarily sugary, although a very mild molasses adds a bit of depth to it. The sweetness then mixes with tomato to deliver the ketchup-y flavor that was prominent in the aroma. Soon after, vinegar begins its build up and the sweet and tangy barbecue flavor arrives. It keeps getting better as one background flavor after another keeps tacking on to build a complex, but not challenging, taste that includes Worcestershire, garlic, onion, and lemon. There's a slight heat at the end that's just enough to intensify the mellow tongue tingle created by the vinegar, but is constantly kept in check by the sugar that's present from start to finish. This sauce went on in an even, light layer that built up with subsequent brushings and baked in very well over indirect heat. When moved over direct heat, there was good caramelization where the leg touched the grates. The flavor came into an even better balance after being cooked with the vinegar popping out more and taking the sugary sweetness down a notch. The freshness of the ingredients from out the jar persisted, giving the chicken a great bright barbecue flavor. Trifecta Original Barbecue Sauce was definitely the right way to end another year of endless reviews. With so many sauces, it can get be easy for any one to be lost among the masses, but both the Trifecta Original and Sweet Heat stood out. What's notable is that it's not a particular aspect that make these sauces so great, but the way they work overall, delivering a thoughtful balance of all the ingredients with a flavor that tastes bright and fresh. For a bottled sauce, this is no small feat. While I did think the Sweet Heat was worthy of its extra point due the added complexity the peppers gave it, the Original is just as good and will give anything it touches an outstanding flavor. 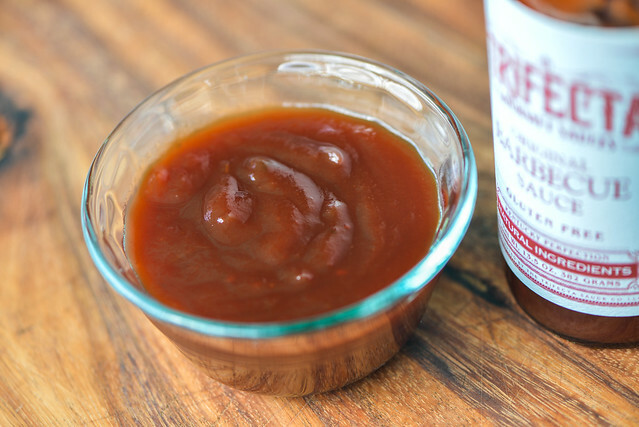 It's a sauce well suited as a condiment or glaze, with enough flavor to take on the big boys like beef or lamb, but not so overstated that it couldn't work some magic on more delicate items like chicken, pork, or seafood.